Two years I have avoided Cloud Atlas like the plague. It’s obviously a very complex and ambitious film – which you can tell by the trailer alone, but it also felt in general like a film I wouldn’t enjoy. Sure, there’s a pretty impressive cast and quite a bit of explosive visuals going on here, as the Wachowski siblings are famous for – but that’s not always what I look for in the film…so needless to say I was very apprehensive about seeing this nearly three hour-long movie. But I knew at some point I’d have to swallow the bullet and watch this very talked-about film. So how was it….well….uhhhhh…it’s confusing. So, this movie is incredibly confusing. Easily one of the weirdest, confusing, and most challenging films I have ever seen. The trailers and the film itself seems to suggest some kind of reincarnation thing going on, but the film feels a little differently. Tom Hanks and the rest of the cast may play a part in each of the six timelines, but I can’t for the life of me figure out how they are personally connected to each other…character-wise. The tone of the stories and things that actually happen seem to flow quite nicely together, but the characters themselves don’t seem to have much in common with each other…and I’m wracking my brain trying to figure that part out. How does one Tom Hanks connect to the other…I may never know. In all actuality, this film feels a little closer to an anthology – with multiple sections interweaving together, but directed by different people, and it can easily feel that way. No, wait, it feels like a mashup. In songs, people mash songs up that have similar usage of chord progression – and in this film, they seem to do the same with emotion, drama, suspense, and romance. Basically, the pacing is actually really good, but you’re going to have a hard time following the thing in general. I don’t know anyone that watched it and asked what was so confusing…because it’s obvious. Actually, I checked the time when things stopped being 100% confusing and started to feel connected in some way – and it was at least forty minutes in. Yes, this film is long – and because of the confusion, it feels even longer. Does it satisfy by the end…I guess it depends on the viewer, but I was still left trying to figure things out. At the same time, I am glad I saw it and don’t have that hanging over my head any longer. To be absolutely fair, the technicalities behind the film are impressive beyond belief. I was blown away at the mere thought of what it took to come up with the things that happen in this film. It looks great, the prosthetics in this film, while flawed, were still impressive. I couldn’t take my eyes off the screen because this was one of those films that if you look away for a second, you’ll be really lost – more so than if you paid strict attention the entire time. 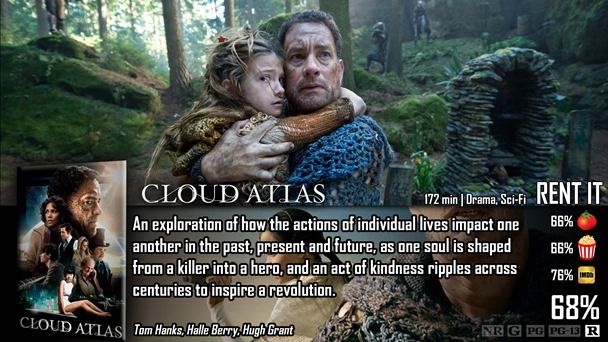 Cloud Atlas in general is a massively impressive venture from start to finish. Even if you don’t fully understand what’s going on, you still want to watch in the event that you figure everything out. The visuals were also great, and as was the very ambition behind this project. I personally don’t like playing games while watching a movie, and that’s what it felt like here – because not only was it confusing and really long, but it never let up and helped me understand things. I’m left to draw up my own conclusions on what certain things meant and how they were connected – and while that’s fine, I definitely prefer more clarity, even if it’s a little bit. It’s a long one, but I found myself mostly hooked by what was going down. Good review Dave.